Click on an item to see information about the picture. 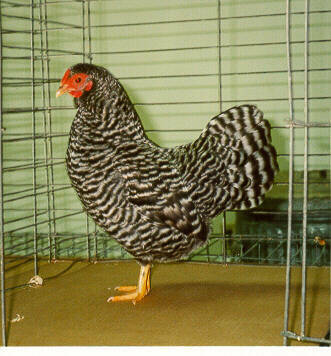 Fine Dominique male from J&S Dominique chickens. Reserve American by Tammy Groleau Newlin at Dayton Fancy Feathers show in Dayton Ohio 2017. Jack Bloomer with a champion Dominique bantam. Jack and his daughter Christina Kiser have raised Dominiques for many years. This picture is included to give a "top view" of a female with excellent tail shape. Notice the flare of the tail from the back. There is no "fluffy area' at the point the tail joins the back. 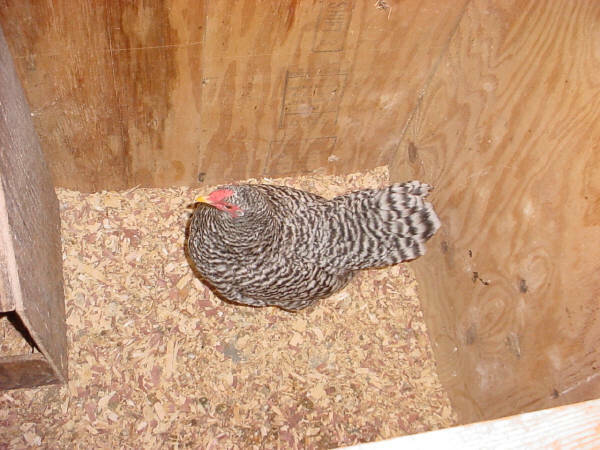 Mike Waski showed this pullet at Connersville, Indiana and I had to have a picture of her tail spread. This is a close to perfect as any tail I've seen. Notice the "teepee" shape of the spread, this cannot be obtained in bird which have a "fluffy bump" where the tail meets the back. Additionally, if the "teepee" was spread further apart at the bottom, then the tail could not be carried high enough. This alert young cockerel is what's needed. Males that start out early with this upright posture generally carry themselves better throughout the rest of their life. An otherwise very nice cockerel. What you cannot tell from this photograph is that the male has narrow twisted wing feathers. An attempt was made to mate him to a number of hens, but the trait came through to the next generation - so all was culled. 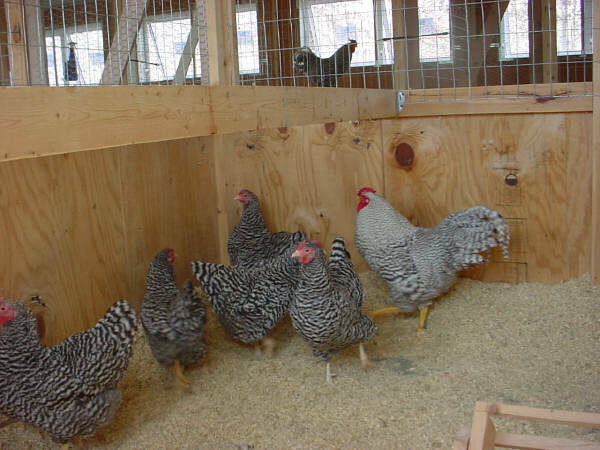 A breeding pen of old hens and a young cockerel of the David Hyman line. 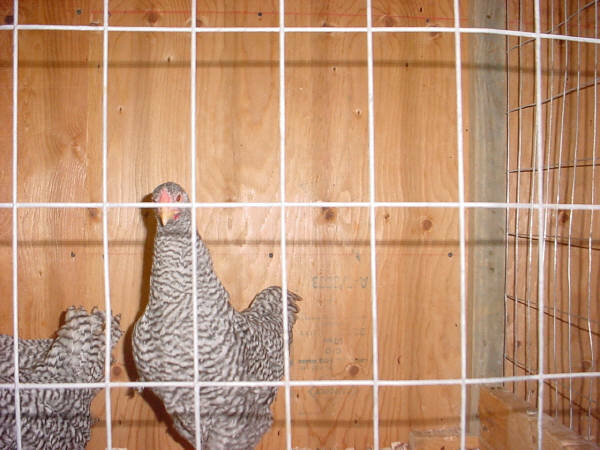 They are a little rough as they have been in the breeding pen for several months. This is an old male from the David Hyman line. His tail wasn't completely in for the show, so it is a bit short. Also he didn't pose well for the photograph as he looks low in the front. 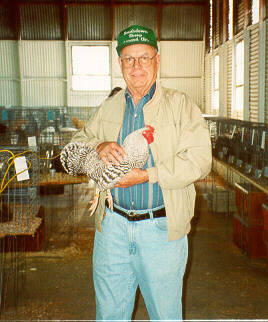 However he knew when to show off - he won Champion in the American Class at the 2004 Missouri State Fair. 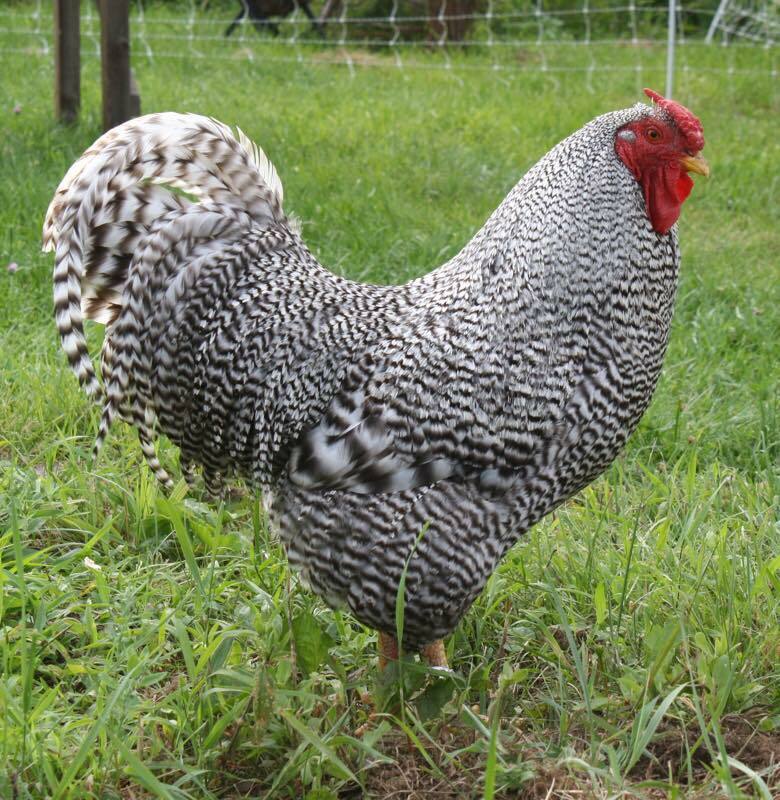 A pullet from the Unbeatable Beauty line. She beat our 197 other birds to win the Reserve Rose Comb Clean Leg class. Exceptional form and color, though the comb could be a little better defined. 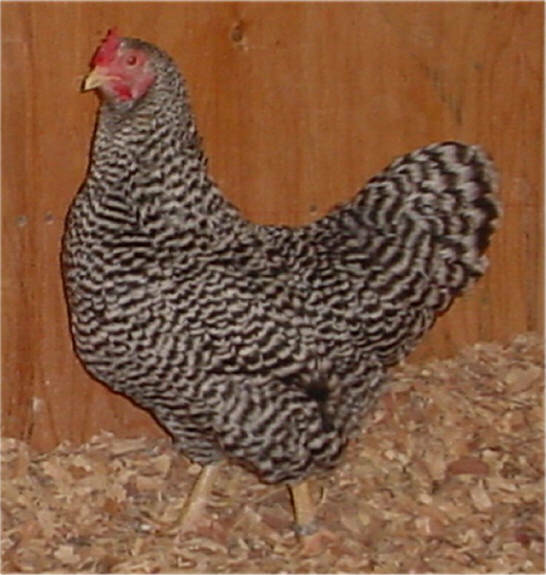 This Dominique bantam cockerel was bred and raised by Walter and Rose Cassazza. I cannot say enough good things about this Dominique. Rarely do we see this quality, especially in the bantams. The only little thing I could possibly fault it on is the wings should be up just a little - but that is truely "nit picking" as this is an exceptional specimen. I absolutely love this photo from Gary and Kathy Hanson. 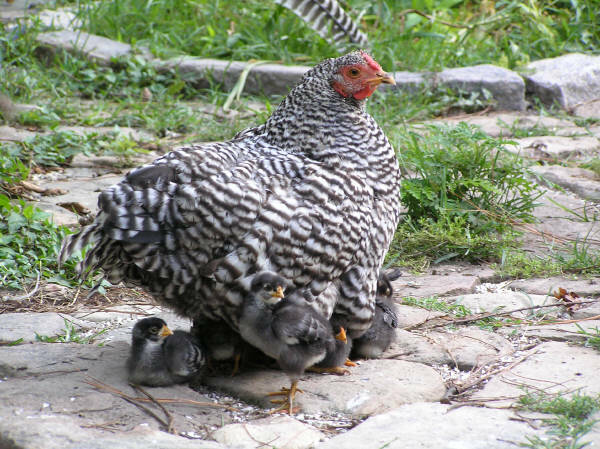 It's easy to see why Dominiques have the reputation for being excellent mothers. In the background is something of particular interest. Notice the feather, standing on end in the grass. At first glance it appears to have even, parallel bars, but look closer. The bars are a little more even than I care for, but the bars are offset down the shaft of the feather. 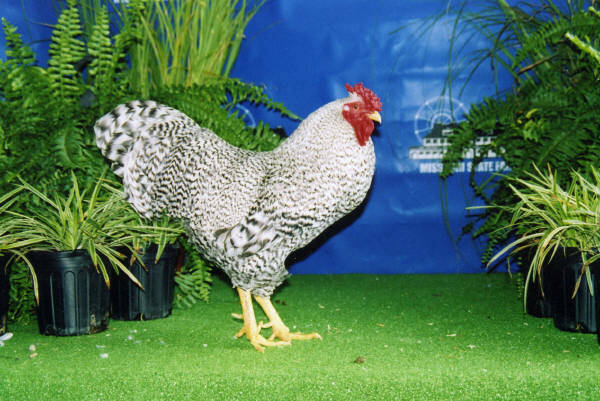 This is a three year old hen from the Hyman family line. Notice the spurs on the hen. 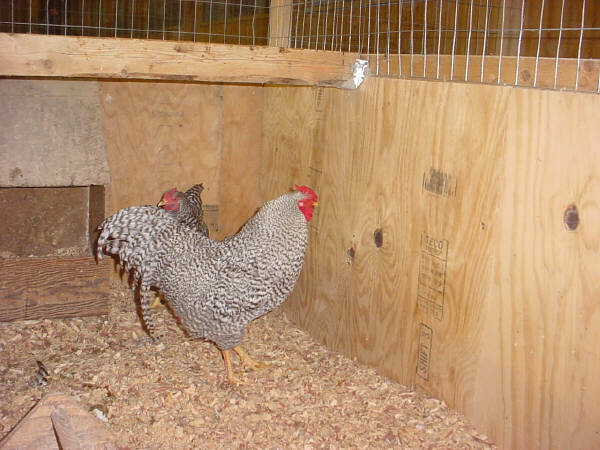 As other faults have been reduced or eliminated in the family line, I've noticed that the incidence of spurs on the hens has increased. In addition these spurs are fast growing and very sharp. The color on this Dominique is "OK", but not exceptional. The dark bars are a little smutty and I'd prefer them to have a blue cast. In the photo this is most obvious in the tail feathers. Also, the light bars are a little weak, not quite the silver-white I prefer. Did you notice the ends of the main tail feathers? They are light bars instead of dark. This is an undesirable trait - but one a judge rarely catches on an otherwise good specimen. This hen has a very nice comb, though it is difficult to tell from the picture. Leg color is weak because the hen is in production. All too often we hear exhibitors make this claim, but in this case it's a fact. Finally, there is one point that all new breeders need to understand. Notice the top tail feather. See how it has a slightly downward curve? This trait is very important. If your females do not exhibit this trait, the cockerels she produces will have short or weak tails. The wider, the longer and the more curved this feather is in the hen the better the tails will be on her offspring. 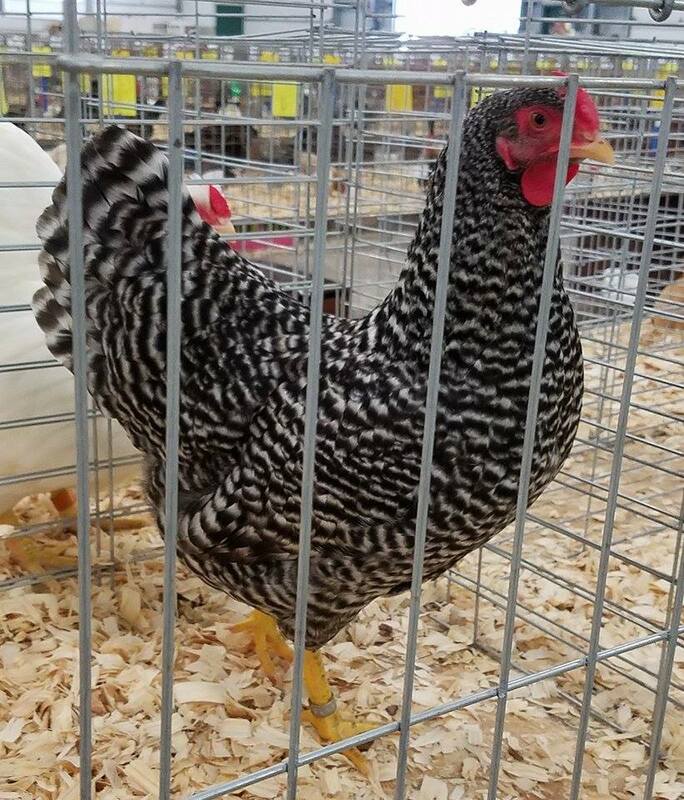 Overall, this is an exceptional Dominique hen. 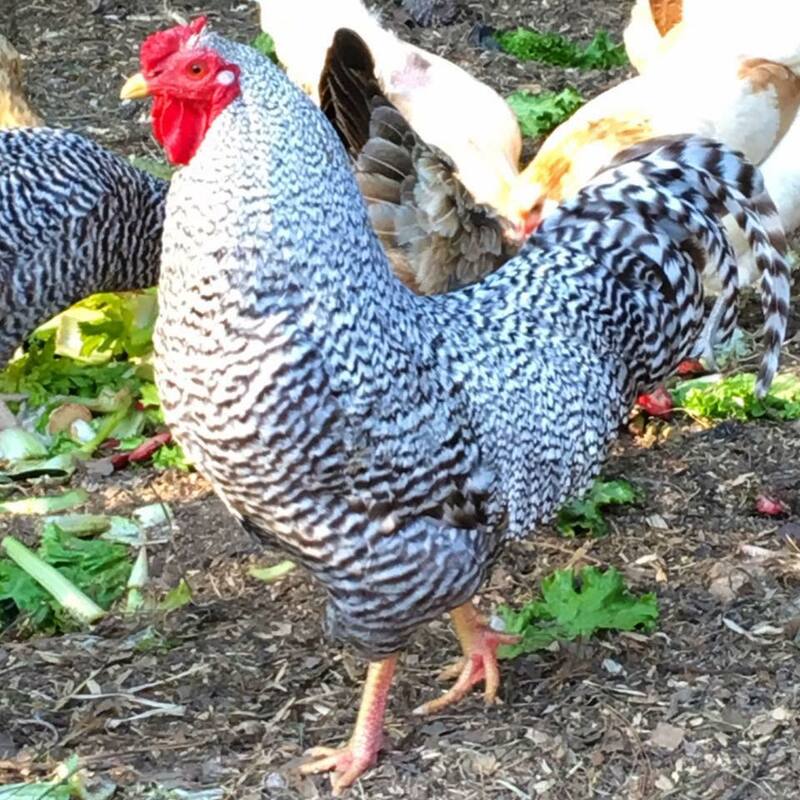 This male bred and owned by Vince Cooper possesses many of the Dominique's finest traits. Notice the upright stance, wings held up and nice flowing tail. 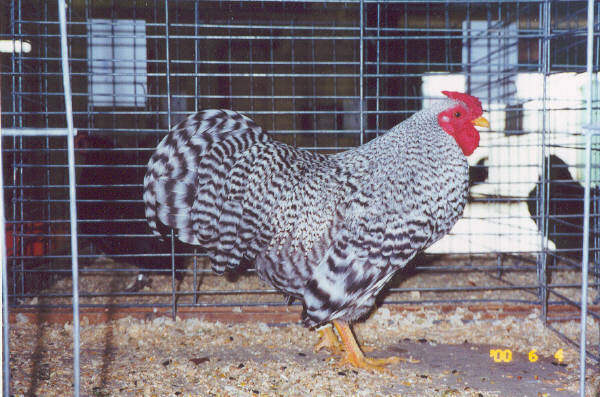 This Dominique pullet was shown at the 2011 Missouri State Fair by Fred Farthing. There is a compliment that I have only given to 3 birds. 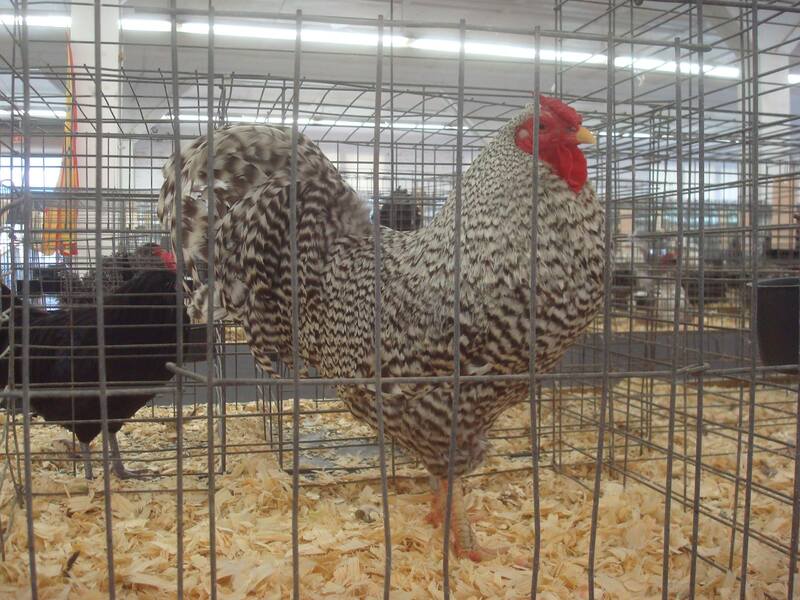 On that day at the fair before the judge came through, I was looking the Dominiques over and I gave this bird that compliment. "I can find no fault with this Dominique." She has type, color, size, good comb, eye color, leg color, condition, etc. etc. etc. It's a shame more Dominique enthusiasts weren't on hand to see what a real Dominique should look like.